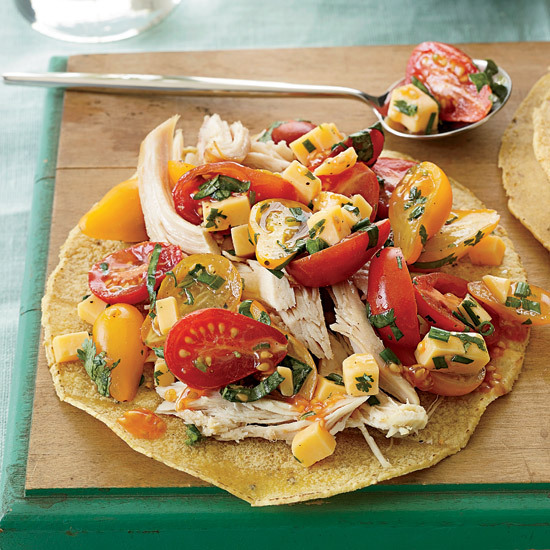 These simple recipes make the most out of juicy, sweet tomatoes. The crunchy, savory kalamata olive streusel that tops this salad from Bryan and Michael Voltaggio is our new condiment obsession. Toss it in your next kale salad, sprinkle over roasted root vegetables or use it to garnish steamed grains. 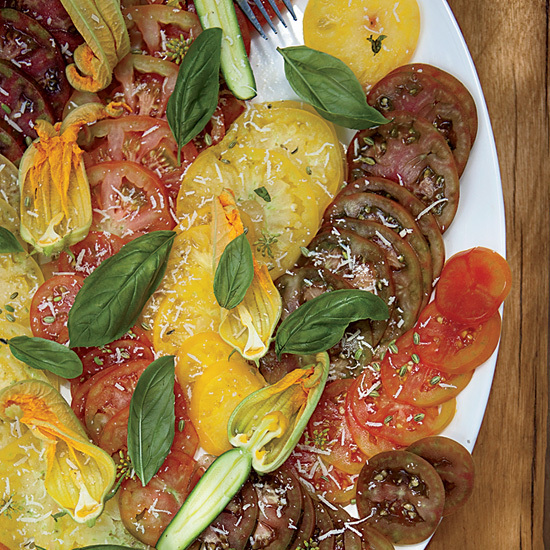 If you can't find good beefsteak tomatoes for this dish, use the best greenhouse tomatoes you can get your hands on. 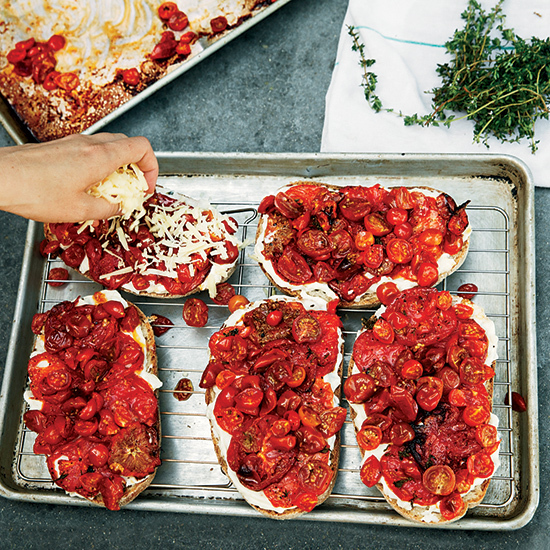 In this summery spin on a croque-monsieur, roasted heirloom tomatoes are piled on bread that’s slathered with creamy béchamel sauce. After a generous sprinkle of Gruyère, the croques are toasted till melty and browned, and then topped with spicy homemade pickled peppers. 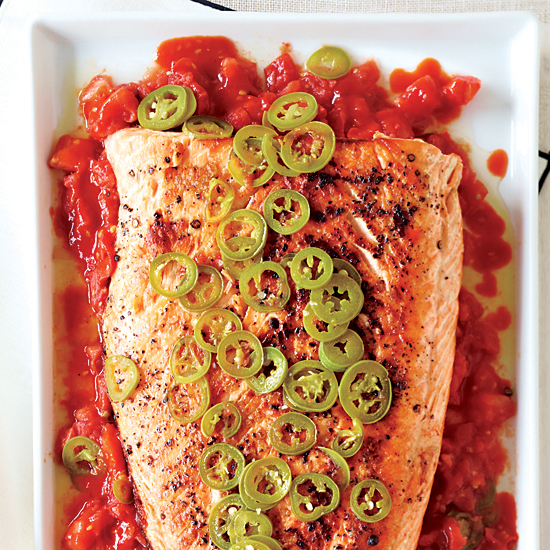 Jalapeños not only garnish this sweet-smoky grilled salmon but also infuse the oil used to sauté the tomatoes. 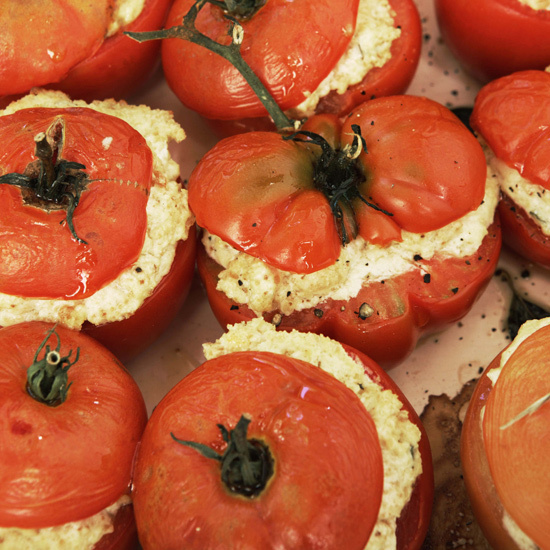 At Commanderie de Peyrassol, the wonderful Provencal winery, chef Guillaume Delaune uses ingredients from his kitchen garden to make dishes like these excellent stuffed tomatoes. He uses a melon baller to scoop out the insides of the tomatoes, leaving a sturdy shell to hold the spinach-and-cheese filling. The accompanying sauce is made from the scooped-out tomato seeds and juices. 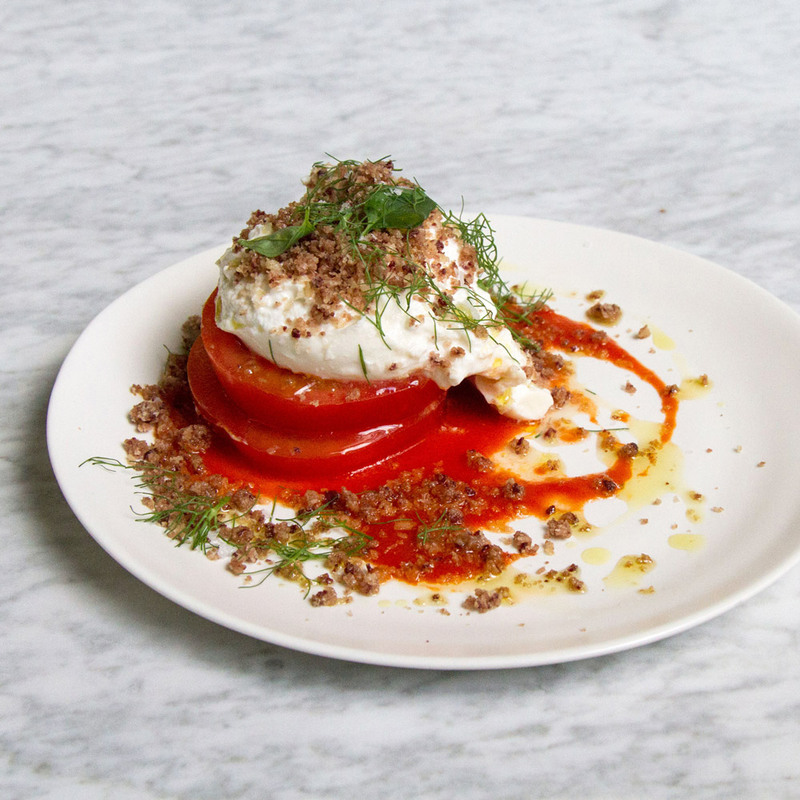 New York City chef Dan Kluger makes a deeply flavorful vinaigrette for summer's sweetest and juiciest tomatoes. Instead of dry-roasting almonds for his salad, Kluger toasts them in olive oil until they're crisp and golden, then uses the richly flavored oil to make a tangy dressing. Richard Blais garnishes his take on a caprese salad of tomato and mozzarella with pickled walnuts, made by tossing candied walnuts with a little vinegar. (Alternatively, use British pickled walnuts, available at some specialty food stores.) “The blue cheese and the celery give this dish a little ‘adultness,’” he says. 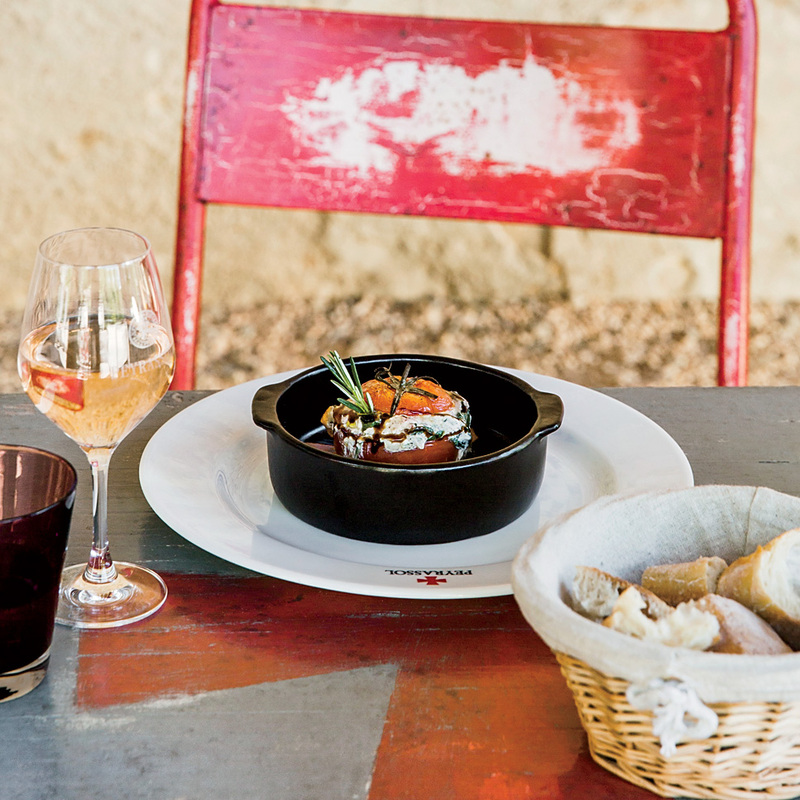 Relishes typically contain cooked and pickled vegetables; the one here is mouth-tinglingly tangy. James Syhabout makes it by pickling shallots, capers, pistachios and pink peppercorns overnight in Champagne vinegar and olive oil. It’s awesome on tomatoes, but he also likes using it on fish. Make sure to use a bright and fruity olive oil. This will coat 1 pound of pasta. 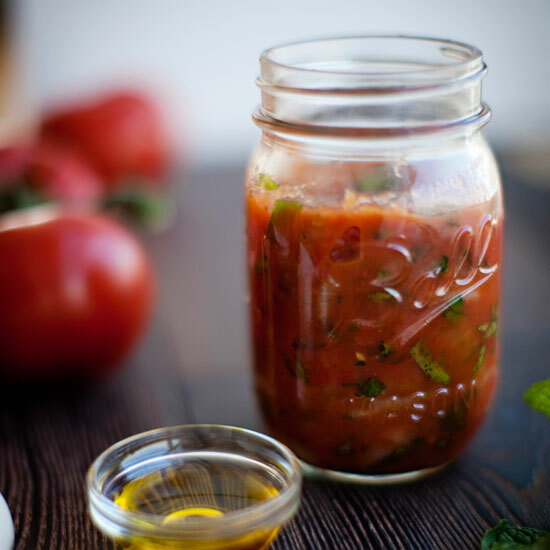 Cooked tomatoes are a good source of lycopene, a compound that fights cancer. 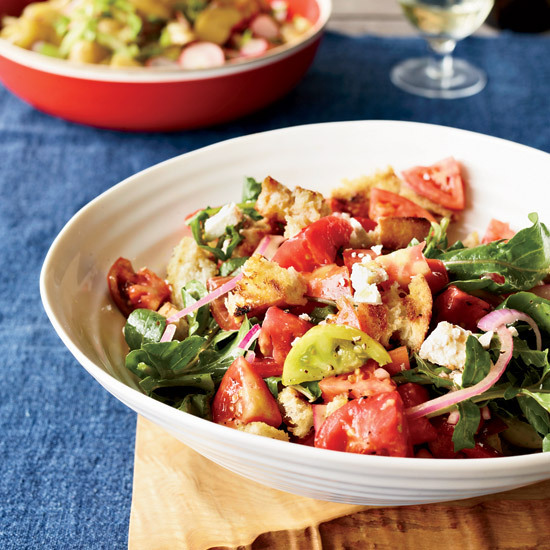 Grilling the bread for this panzanella (bread salad) adds a slight smokiness and crunch. 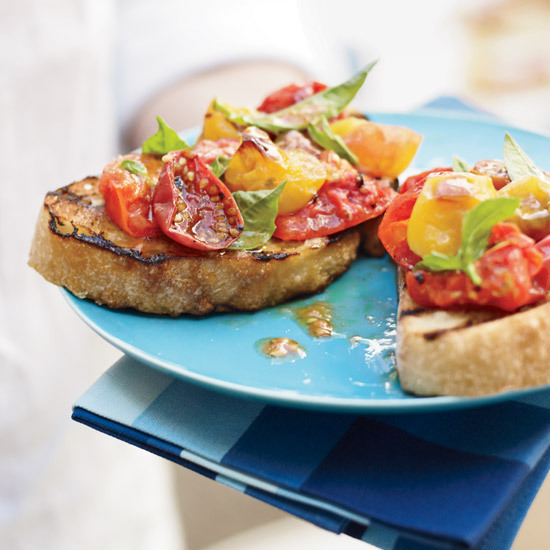 Marinate the tomatoes ahead of time so all you have to do is grill the bread and assemble the salad to serve. Kat Kinsman is known for clever drinks like this lemonade. 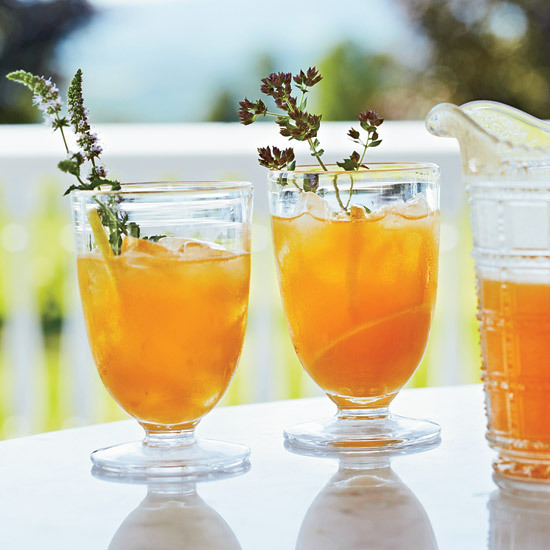 It's perfect on its own as a mocktail, but Kinsman recommends adding a shot or two of rye whisky to make the tomatoey drink "reminiscent of a wonderfully tipsy deli sandwich." Gin or vodka would be a great addition as well. Chef Floyd Cardoz, an avid fisherman, will focus on seafood dishes at his upcoming downtown-Manhattan restaurant, North End Grill. 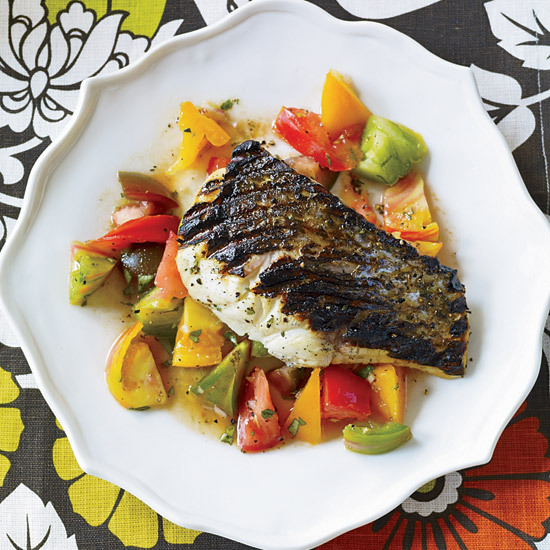 A favorite is this summery grilled bass with ginger-spiced tomato salad. 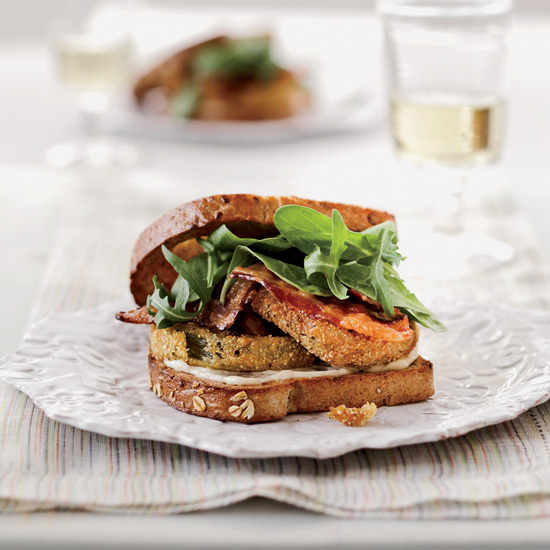 This is a brilliant marriage of two classics: cornmeal-dusted green tomatoes and a bacon, lettuce and tomato sandwich. 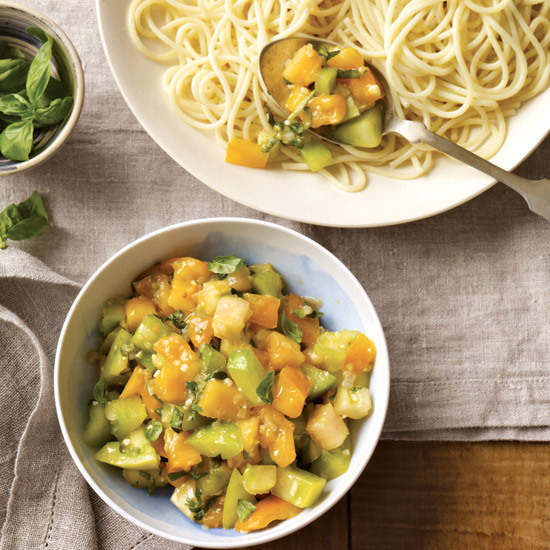 Inspired by an Italian Caprese salad, this tomato salsa is full of calcium-rich cheese. It’s so chunky it could be eaten on its own with a fork, but it’s also wonderful with shredded chicken. 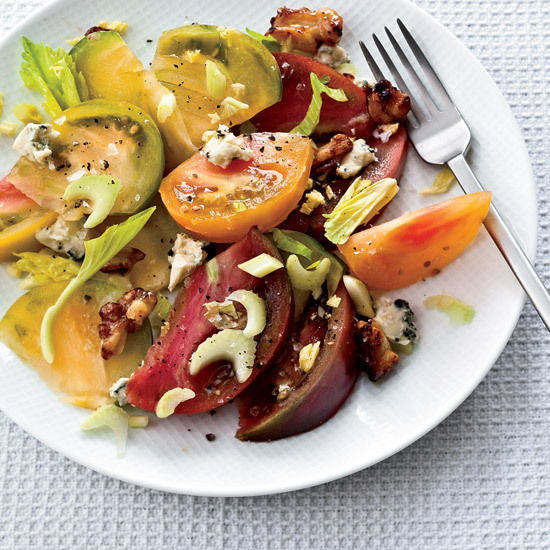 “Although we call it an anchovy vinaigrette,” says chef Amelia O’Reilly, “we like to keep the vinegar and anchovies separate until they’re on the plate; otherwise the anchovies taste pickled.” The dressing is a great way to add savory accents to summer’s sweetest, juiciest tomatoes. For these buttery-soft roasted tomatoes, Alain Coumont boosts the flavor of the creamy goat cheese filling with garlic and basil. 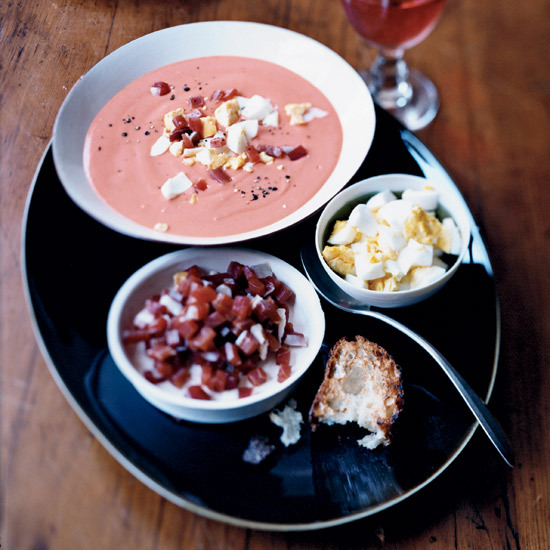 The result works both as a side dish or a main course with a salad and crusty bread. Josh Kilmer-Purcell and Brent Ridge make yogurt from the goat milk produced on the Beekman farm. 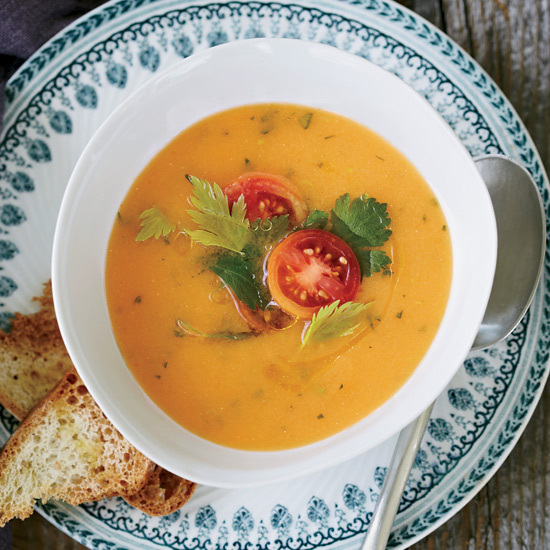 They blend the tangy yogurt into this herb-flecked soup. 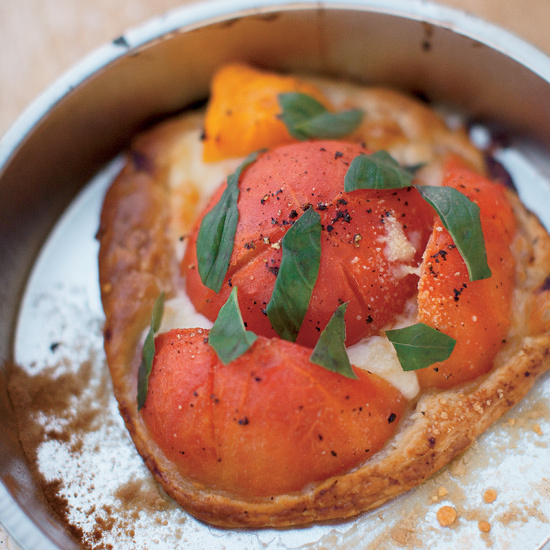 Andreas Viestad’s tarts have a flaky crust topped with tomatoes that become wonderfully sweet as they bake. 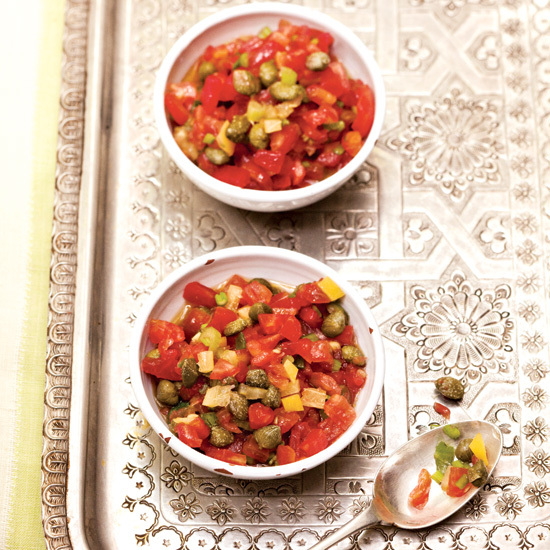 When guests sit down to the dinner table, Moroccan hosts often set out small salads to eat with bread or on their own. Paula Wolfert found this salad in Essaouira, along the Atlantic coast. 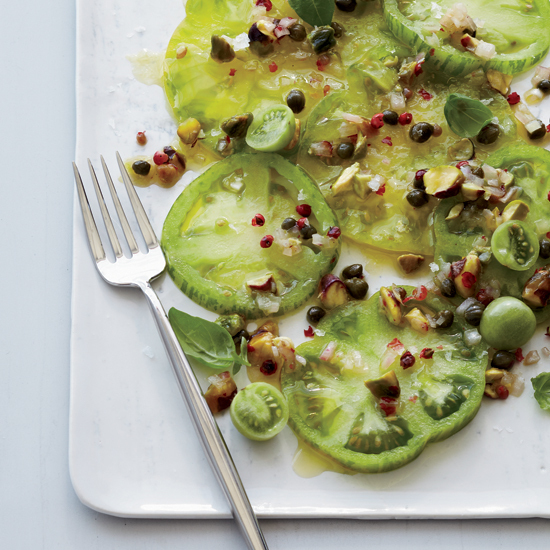 She says it’s rare to see capers in Moroccan salads, even though the country is one of the world’s leading suppliers. 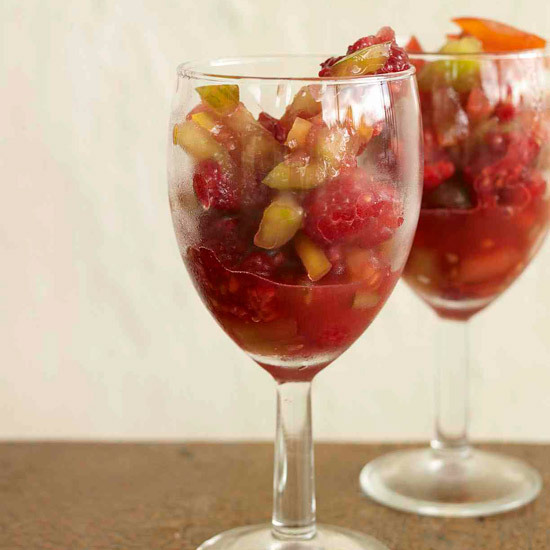 As a light, refreshing dessert, Andreas Viestad freezes cherry tomatoes and raspberries to make a chunky granita. 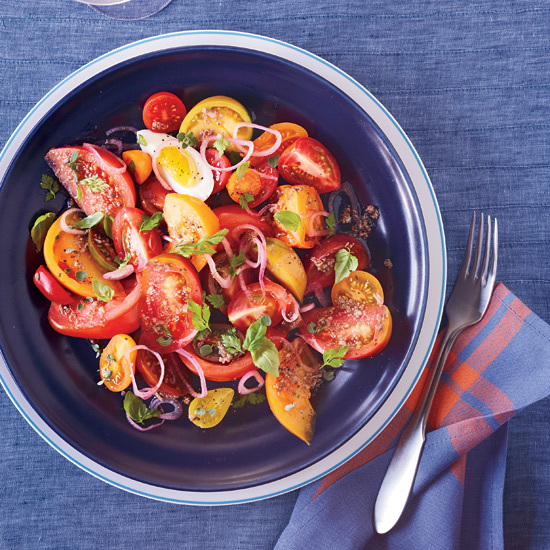 “This is the tomato salad I make almost every day,” Andreas Viestad says. Since he always uses different varieties of tomatoes, the salad tastes different each time. 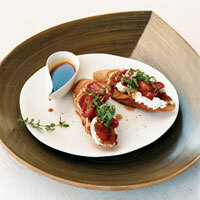 After the bruschetta is assembled, a drizzle of robust buckwheat honey balances the creamy ricotta cheese. For this light, uncooked sauce, you must have perfectly ripe tomatoes. 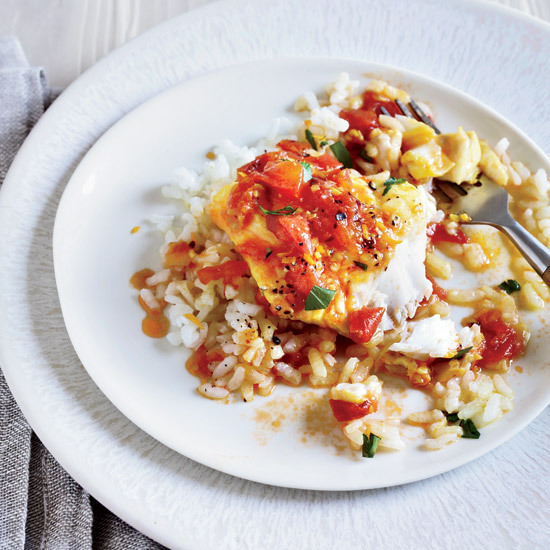 A garlic-tomato sauce for cod gets Sicilian flavor from orange zest and saffron. 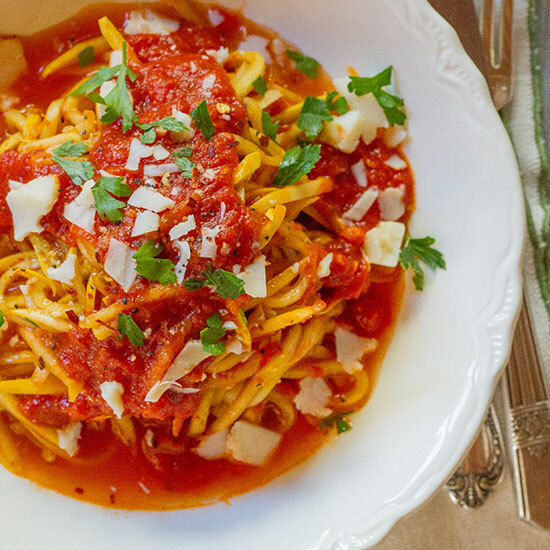 Thinly sliced yellow squash is a wonderful gluten-free alternative to semolina noodles. 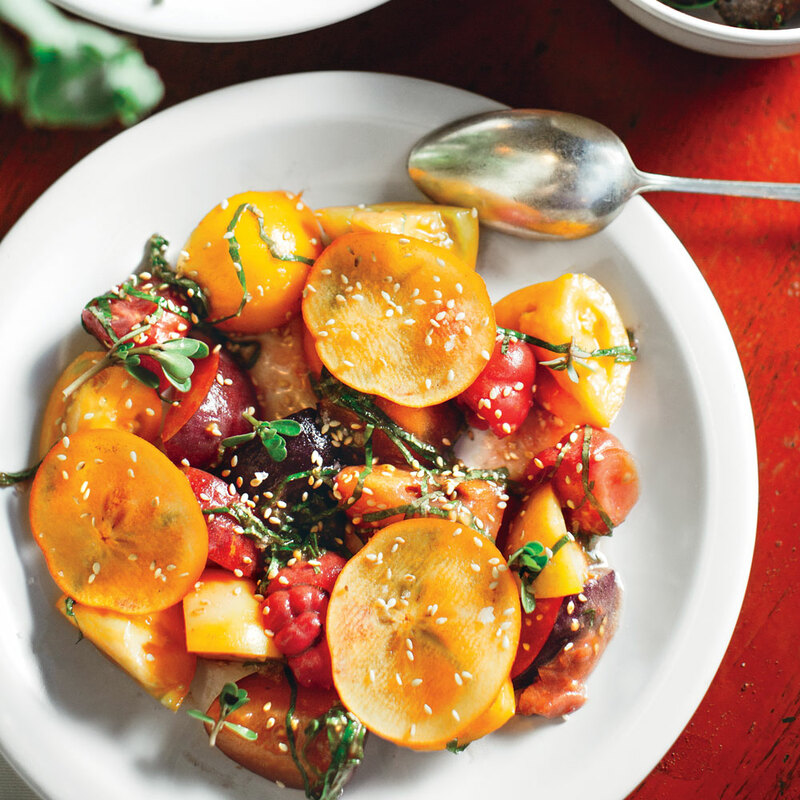 Shaved persimmon and sesame seeds add texture.